What goes into this zippered version of our signature tote? 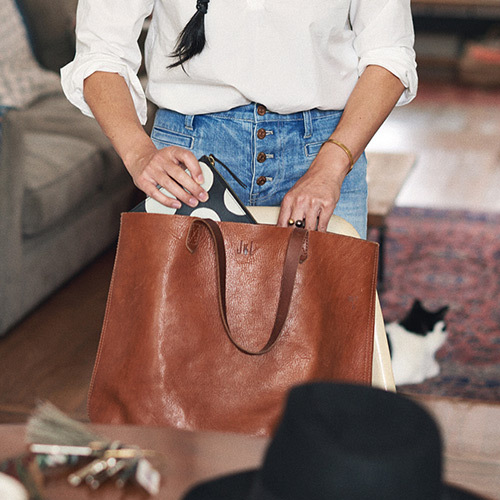 Here it is by the numbers: 2 pieces of fine leather are used for the body of the bag. 1 zipper that keeps all your stuff (laptop, book, snacks) safe and sound. 3 interior pockets, including one with a zipper to keep your keys and phone at the ready. 8 hours: the length of time you'll need it between your morning and evening commute. How often you'll reach for it? 500 gazillion times. 15" (at shortest) to 19 3/4" (at longest) crossbody drop. 11 3/4"H x 16 1/8"W x 5 1/2"D.